Here is the Smilin’ Ed’s Gang story from Buster Brown Comics Book #23 from 1946. 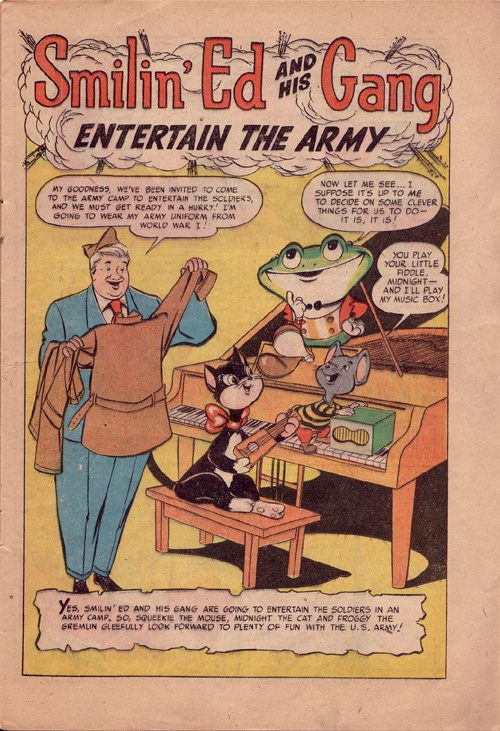 “Smilin’ Ed and His Gang Entertain the Army” is the name of the story. They opted to have Squeaks and Midnight talk in the comics. Smilin’ Ed again is Andy’s predecessor who met a sinister and untimely demise. It isn’t surprising… Froggy attempts to murder him multiple times in this story. 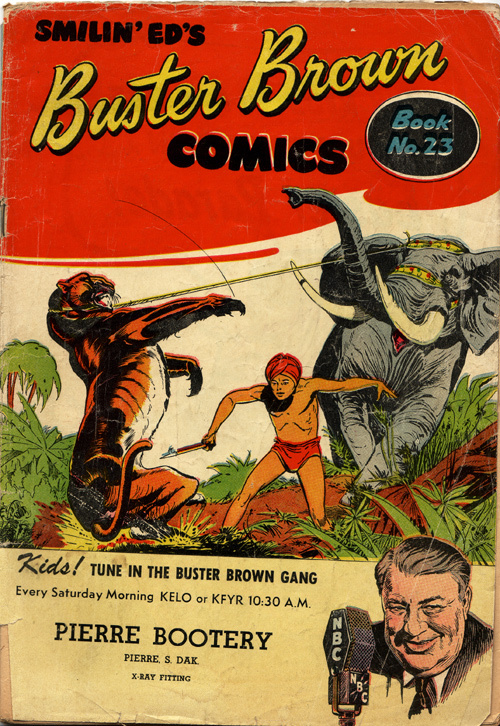 There are two other stories in the book as well that I didn’t scan… one is called “The Poachers” and is about an Indian boy named Ghanga and his elephant (seen on the front cover)… the other story, “Black Lagoon,” is about a South Pacific island boy named Suki and his chimpanzee Coco. Boy from exotic land with exotic pet seems to be the recurring theme of choice in these comics (judging from this issue and #27 and 28, which I also have). What? You mean a comic book with Buster Brown in the title doesn’t feature Buster Brown? Well, actually, it does. In the ads for Buster Brown shoes. These comics were giveaway premiums at shoe stores and department stores that sold Buster Brown Shoes. 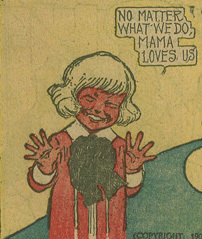 The store name is printed on the bottom part of the front cover, and all the ads in the comic are for Buster Brown shoes. Usually only his iconic image appears in an issue. Wait a minute… our scamp isn’t making mischief at all! Tige’s jolly laugh is nowhere to be seen. Buster is just selling shoes! He’s being helpful! 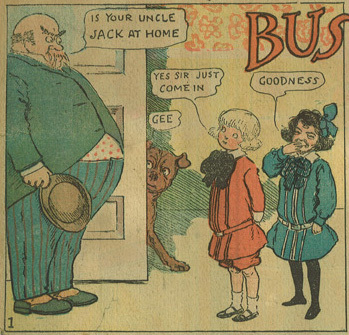 What has become of our Buster, our impish rascal of yesteryear? Wait a minute… the kid in the last panel with the new shoes… his feet are glowing. Why that’s it! Buster hasn’t reformed at all! He has taken to irradiating children’s feet with a shoe-fitting x-ray machine (Note the mention of X-Ray fitting on the front cover below). That smug kid with the new shoes will be keeling over with foot cancer in no time! Ha ha ha! Oh, that Buster. Download a 27MB pdf of the comic book, minus the boy from exotic land with exotic pet stories, by clicking the below image. 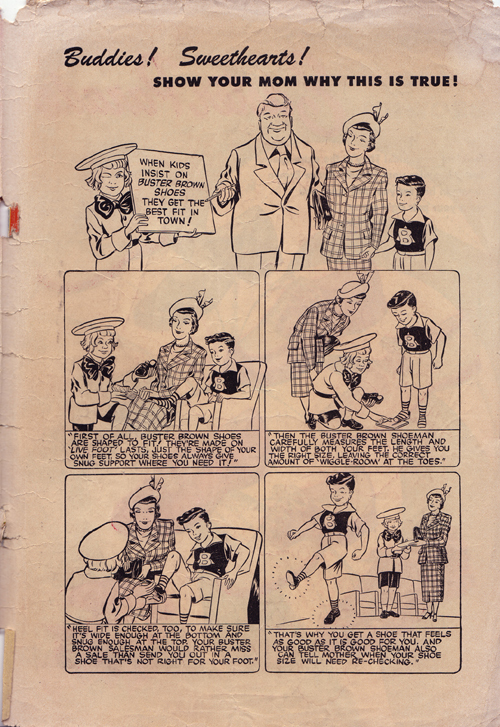 See an excerpt from an issue of Buster Brown Comics featuring Smilin Ed’s Gang aka Andy’s Gang courtesy of Stupid Comics here. Read more about Andy Devine on Wikipedia. Visit the grave of W.H. "Major" Ray aka Buster Brown here. 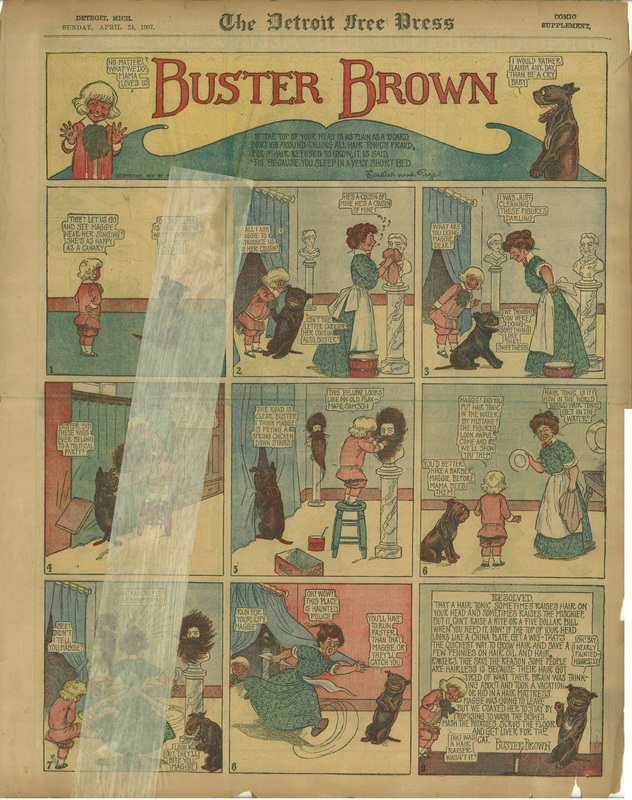 Here’s another great example I scanned of Buster Brown, this one from August 5, 1906 by Richard F. Outcault, with some nice experimentation with panel time and space. Click here to read more examples of Buster Brown at Barnacle Press. See the last Buster Brown strip at the Stripper’s Guide. Click here to read about Richard F. Outcault at lambiek.net. 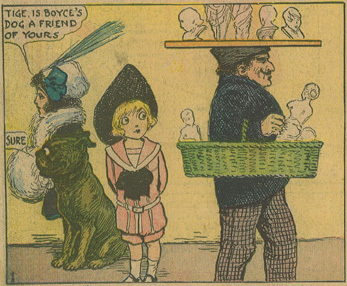 See a Buster Brown original (with the Yellow Kid) at the Library of Congress website. Read more about R.F. Outcault at Ohio State University’s website. See examples of Outcault’s Yellow Kid at Ohio State University’s website. 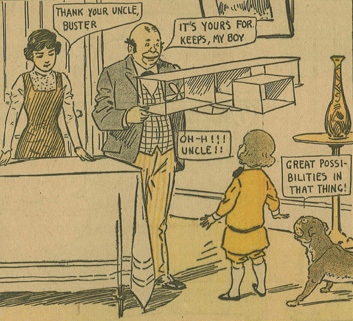 Click here to read more about Buster Brown at Toonopedia. 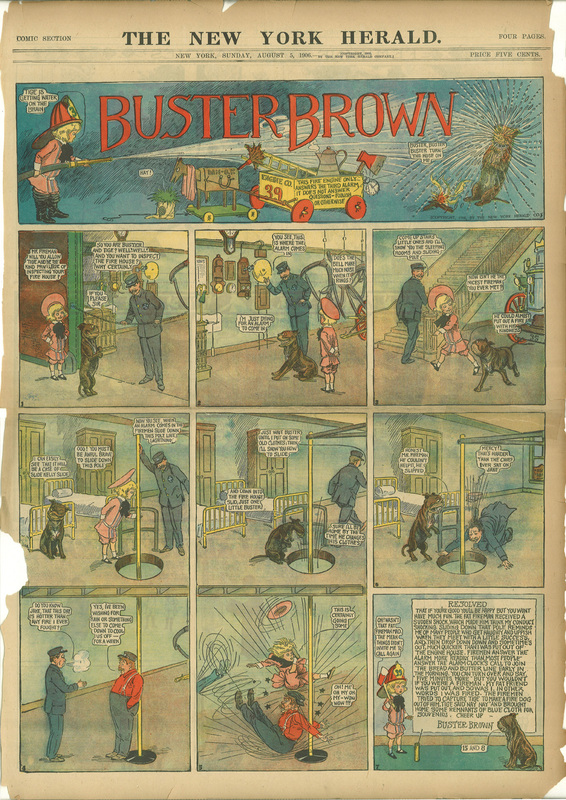 Hear a radio program on the history of Buster Brown at npr.org. Visit the website of the R.F. Outcault Society. Read the Wikipedia entry on Buster Brown. Read the Wikipedia entry on R.F. Outcault..
Read the Wikipedia entry on The Yellow Kid. 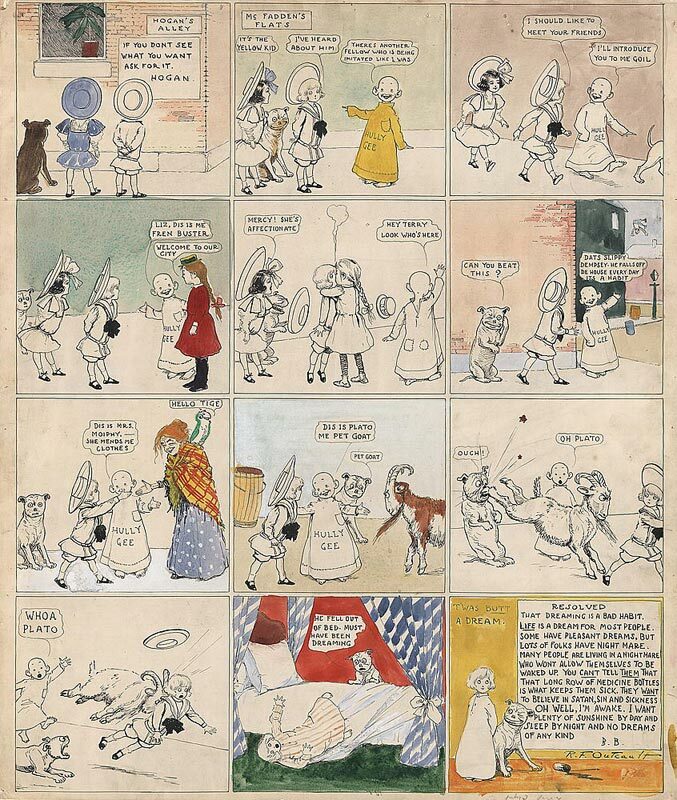 See the copyright application for the Yellow Kid at the Library of Congress website. Read Outcault’s obituary from a 1928 Time Magazine. 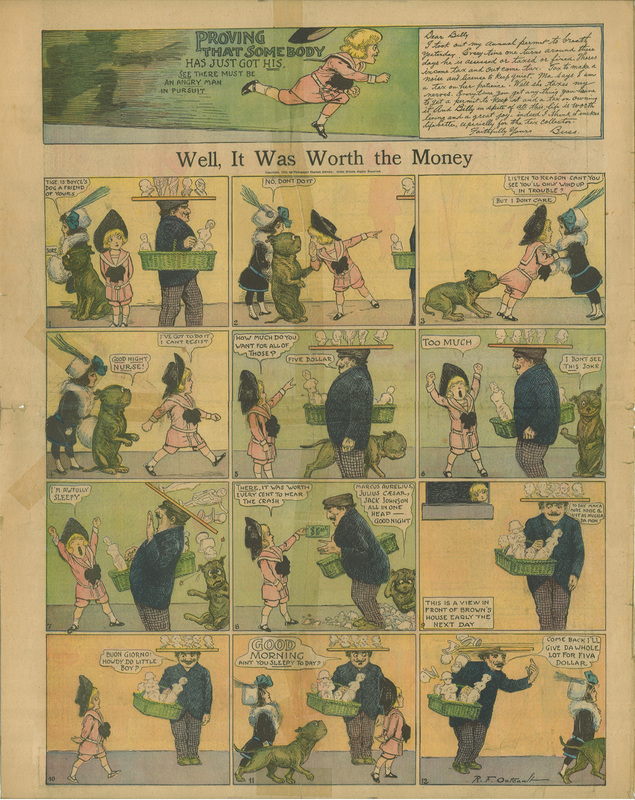 Here’s a great example I scanned of Buster Brown from April 8, 1906 by Richard F. Outcault. 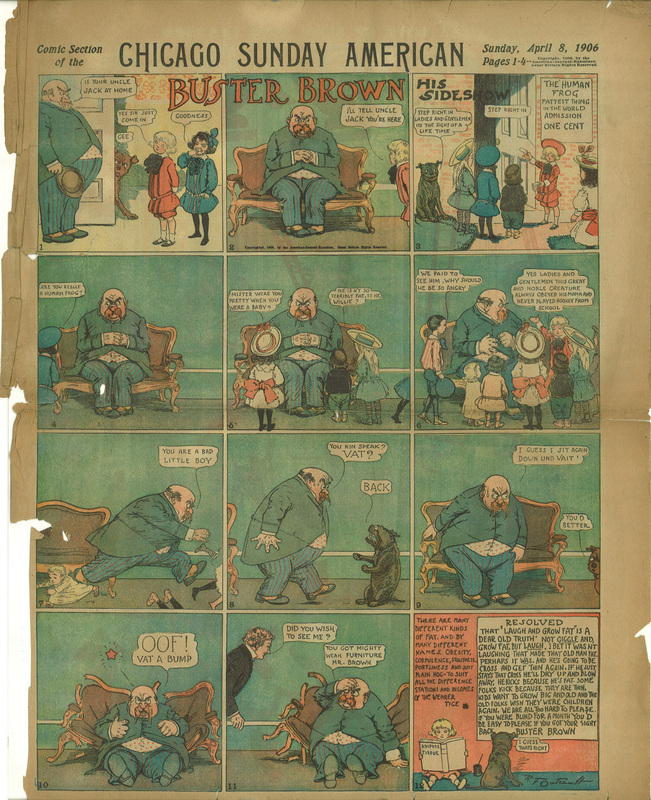 Here’s an example I scanned of Buster Brown from April 21, 1907 by Richard F. Outcault. You can see a black and white version of this strip where tape does not mar the image at Barnacle Press here. 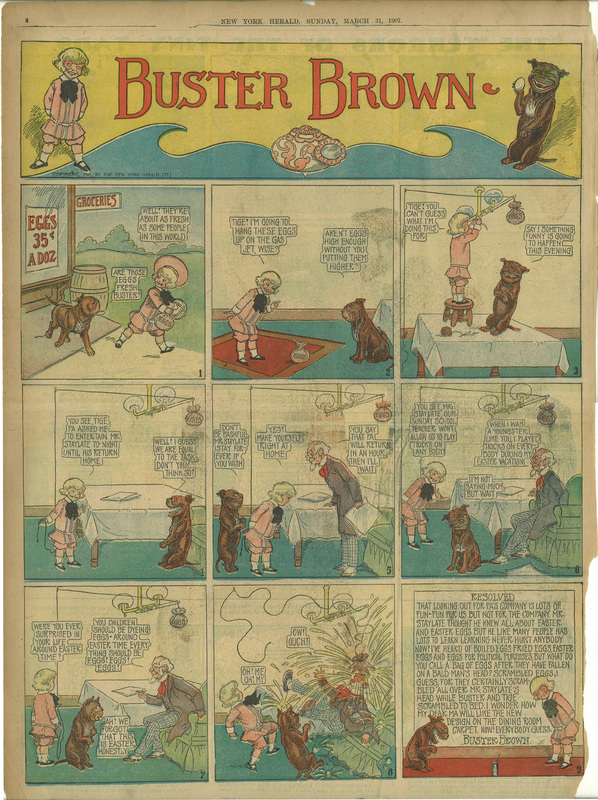 Here’s an example I scanned of Buster Brown from 1915 by Richard F. Outcault. No “resolution’ at the end of this one… I’m guessing they may have gotten rid of those at some point, since this is a later strip than the previous examples. 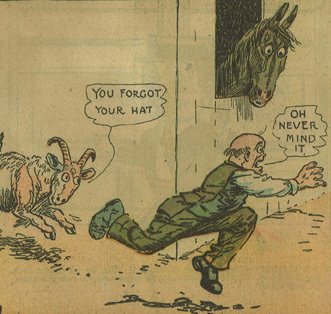 Note that this strip contains the sort of stereotyping that was typical of comics of the era. If that sort of thing offends you, you may not want to view it. 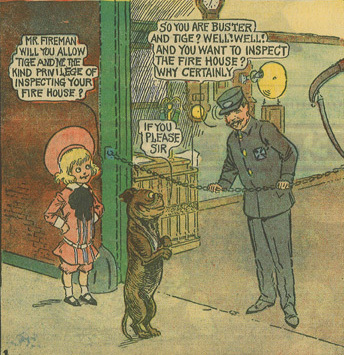 Here’s a particularly hilarious example I scanned of Buster Brown from February 15, 1914 by Richard F. Outcault. 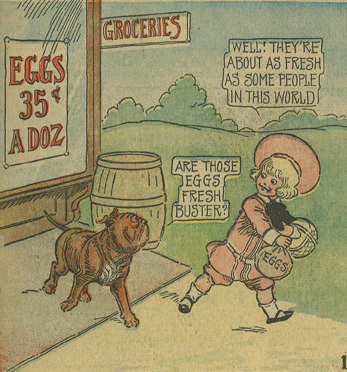 Here’s an Easter example I scanned of Buster Brown from March 31, 1907 by Richard F. Outcault. Tige has the best smile. 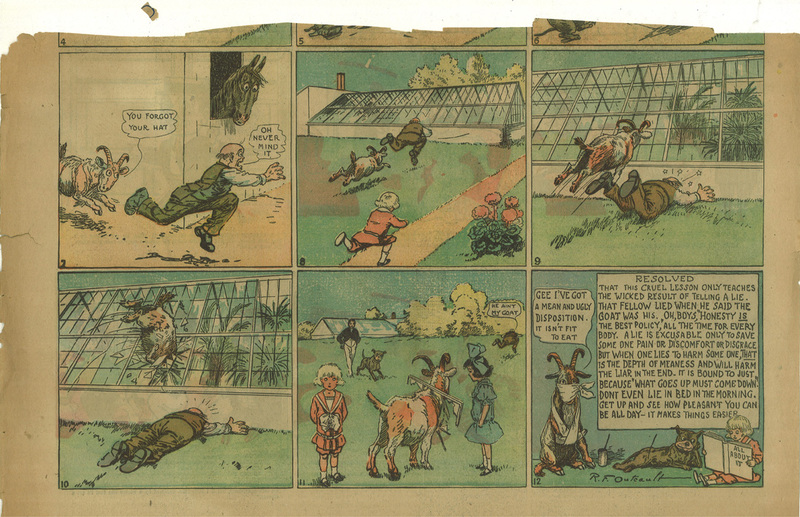 Here’s an example I scanned of the remaining half of a horribly mutilated Buster Brown strip by Richard F. Outcault. 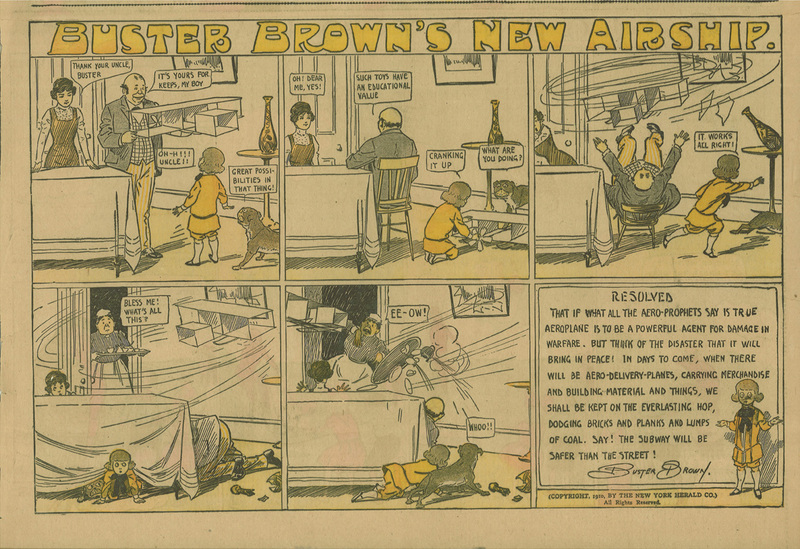 Here’s an example I scanned of Buster Brown from 1910 by Richard F. Outcault, seven years after the Wright Brothers made their first flight (whose authenticity was not widely believed for many years after that). I’m much too young to have ever seen Andy’s Gang when it was on the air, but thanks to this wonderful internet, I’ve now experienced some of it. Oh, the horror! Let me share it with you. Meet our creepy host Andy Devine, here giving the blatant hard sell for Buster Brown shoes to some impressionable young minds. Just wait until I introduce you to his Gremlin. Watch this to the end to see the also creepy little person, W.H. "Major" Ray, that they have impersonating Buster Brown. Andy took over the show, formerly called Smilin’ Ed’s Gang, from Smilin’ Ed McConnell in 1954, in a switchblade fight. Smilin’ Ed, it seems, had outgrown his usefulness to the sinister Gremlin. As far as I can tell no footage of Smilin’ Ed’s Gang exists on the internet. Shortly after Smilin’ Ed’s disappearance, Andy destroyed all recordings, burning them with siphoned gasoline in an abandoned drive-in theatre parking lot… covering up any evidence of his predecessor in an attempt to seamlessly replace him in the minds of the children of yesteryear. However, some of the comic books have survived. I may have made this all up, but it rings true, don’t you think? Someone, please, update Wikipedia and adjust reality appropriately. 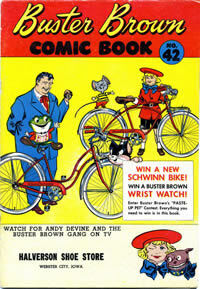 Above: covers from the Buster Brown comic book before and after Andy’s hostile takeover of the Gang. 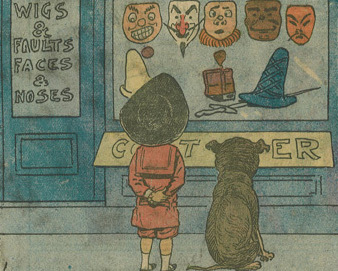 It should be noted that I do not believe the Buster Brown comic book ever contained any comics featuring the character Buster Brown (other than as an icon on the cover). 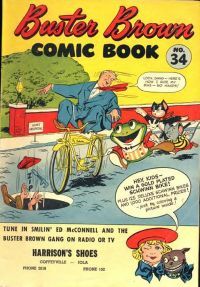 See an excerpt from an issue of Buster Brown Comics featuring Smilin Ed’s Gang courtesy of Stupid Comics here. Read about Smilin’ Ed McConnell on Wikipedia.